Months prior to the 2016 elections, surveys pointed to the following issues as most urgent and pressing for the Filipino people: controlling inflation, increasing workers’ pay, fighting graft and corruption, creating more jobs, and reducing poverty. 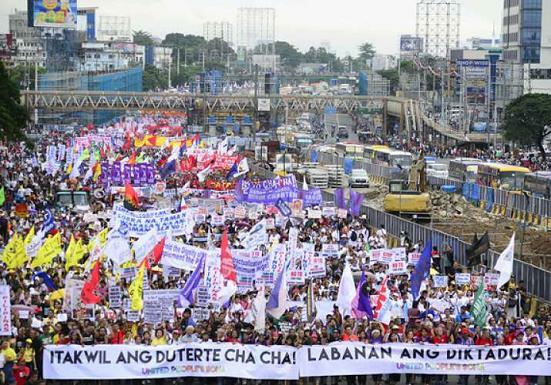 When Duterte was elected, there was an expectation, especially from the 16 million Filipinos who voted for him, that a “strongman” could finally fix the problems and deliver on these urgent demands. That was the great gamble of 2016. People took the risk with Duterte, hoping that he would deliver. In 2017, Focus came out with a Policy Review on Dutertismo , looking at how Duterte’s campaign promises and pronouncements have been translated into policies. The initial signs did not point to a substantive shift towards a more pro-poor development agenda. Duterte also said in his SONA, “Our improved relationship with China does not mean that we will waver in our commitment to defend our interests in the West Philippine Sea.” But Duterte’s pivot to China has made the Philippines strategically and politically vulnerable to the Chinese agenda and debt-trap diplomacy. Falling into overdependence on Chinese investments and loans would not only cripple the Philippines’ attainment of a self-reliant and independent national economy, but also destroy communities with their encroachment into critical areas, such as what is happening in the Cordillera in Luzon, Boracay in the Visayas, and Marawi in Mindanao. Public institutions like the Commission on Human Rights, and the office of the Ombudsman, have been criticized and maligned publicly; judicial independence has been compromised with the removal of Chief Justice Sereno via quo warranto. Divisive. Duterte has been a divisive rather a unifying leader. Duterte’s reckless rhetoric has further widened the divisions and sown hatred and animosity among Filipinos. We have witnessed his incessant attacks against anyone expressing dissent. Those not supporting the deadly War on Drugs are labeled drug-coddlers; anyone criticizing the government is labeled a terrorist. Duterte’s tirades against the Catholic Church and his “God is stupid” remarks have not only alienated the Catholic faithful and raised broader concerns over religious intolerance, but have also encouraged violent attacks against the clergy. Three priests have been killed in broad daylight in the last 6 months. His flip-flopping on foreign policy issues is also causing confusion and division. Rather than taking advantage of the nascent interest created by his campaign promise of charting an independent foreign policy, Duterte has instead dabbled in sly hedging games, boldly announcing an economic and military “separation” from the country’s erstwhile colonizer yet kowtowing to an emerging global power, further fueling geopolitical rivalry in the region. His administration’s “two-track and quiet diplomacy” with China has further undermined Philippines’ sovereignty; his cavalier approach to the simmering territorial and maritime disputes in the West Philippine Sea/South China Sea has also divided the nation. These divisive stances are reflected even in domestic policy. Duterte’s “wars” – against drugs, against vagrants, against Moros, against Lumad – are not leading to long term solutions the country so desperately needs. We are now beginning to see cracks within the administration. The tussle for the House leadership; talks of splits within and exodus of members from the administration’s PDP-Laban party; members jostling for position in preparation for the 2019 elections; and the disagreements within the administration and its allies over the No Election scenario and positions on term extension are all fodder for a more tense and potentially explosive political environment.